No ugly tail! No LUMP! Less bulk under your legs! Closeout Item. Limited stock available. These leather ONE-strap stirrup leathers put only ONE piece of leather under your legs. And, they are EXTRA comfortable, because they are WRAPPED with an additional layer of soft, supple leather. 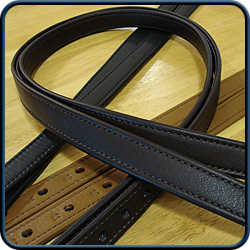 Sewn-in loops slide over your stirrup bars to fasten the stirrup leathers to your saddle. Down at the opposite end, stainless steel Conway buckles and keepers fasten the stirrup leathers to your stirrups. With the buckles down low, near your ankles, you will be able to adjust your stirrup lengths more securely while seated in the saddle. We stock the REGULAR length, which can be adjusted from 17" to 21" long. Each stirrup leather has 12 adjustment holes. We stock the LONG length, which can be adjusted from 21" to 25". Each stirrup leather has 12 adjustment holes.